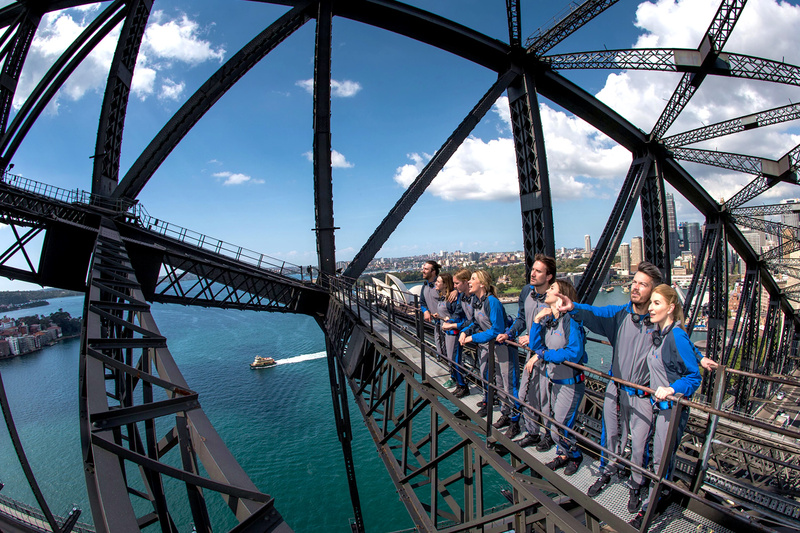 Exhilarating and utterly unforgettable, BridgeClimb gives you the incredible opportunity to walk to the summit of the Sydney Harbour Bridge and enjoy one of the world's most spectacular views. ^Departure time will be advised in booking confirmation. Ensure you arrive 15 minutes before your scheduled Climb time to allow enough time to check in. ● Enclosed, rubber-soled shoes such as running, sport or hiking shoes. ● You will be provided with suitable outdoor gear depending on the day's weather conditions. - If you are pregnant, over 75 years of age or have any pre-existing health conditions please refer to the Health and Safety Essentials section as you may need to provide a doctor’s Certificate of Fitness note before you climb. Please visit and download the form at https://www.enjoyaus.com.au/pdf/Certificate_of_Fitness.pdf and have your doctor signed the form beforehand. Please bring signed form to the climb on the day. - You must have a blood-alcohol reading below 0.05 to climb (the same as if you are driving). 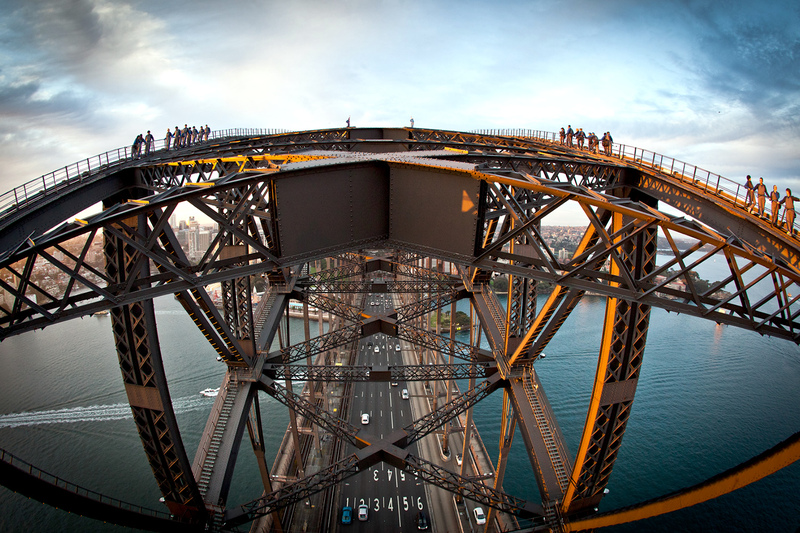 - We will ask you to complete a BridgeClimb Declaration Form before your Climb. Please be honest about your health so we can ensure your wellbeing is not at risk. All discussions will be confidential. - Ensure that you have eaten before your Climb and you’re well-hydrated – the experience can last up to 3 ½ hours. - Wear comfortable, enclosed rubber-soled shoes such as running, sport or hiking shoes and don’t forget your sunglasses. We recommend wearing comfortable clothing. - We’ll equip you with everything else you need for your Climb! We provide FREE secure lockers for you to keep your personal belongings in, including phones, cameras and GoPros. Our Climb Leaders will capture photos of you during your Climb. For safety and security reasons, cameras, video technology and mobile devices are prohibited on the Climb. Children aged 8 to 15 must be accompanied by and are the responsibility of an adult, with a maximum of three children per adult. We will equip you with all the gear you need to keep you dry, but remember to bring your own shoes, which should be enclosed, like running shoes. In case of extreme weather conditions like electrical storms or during times of extremely high wind, Climbs may be postponed. ● HEALTH & SAFETY ESSENTIALS: CAN YOU CLIMB? - If you are over the age of 75, you can climb with a Certificate of Fitness signed by your GP. If you have any questions, or are concerned about your ability to climb, please check out our FAQs or speak to our team for advice before booking. - Safety is and always will be our number one priority for all of our Climbers. - We will equip kids of this age in smaller BridgeSuits, belts, gloves, or fleeces based on the day’s weather conditions. - Climbing the Bridge is an all-age experience. The stories our Climb Leaders share during the experience is appropriate for a broad age range. 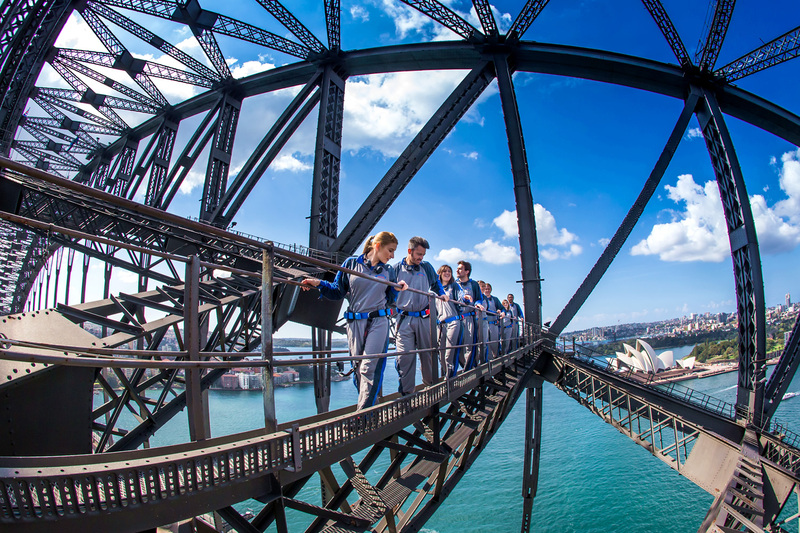 - Parents/guardians must remain with their children throughout the Climb experience, and must assist BridgeClimb team by managing their equipment preparation and behaviour. 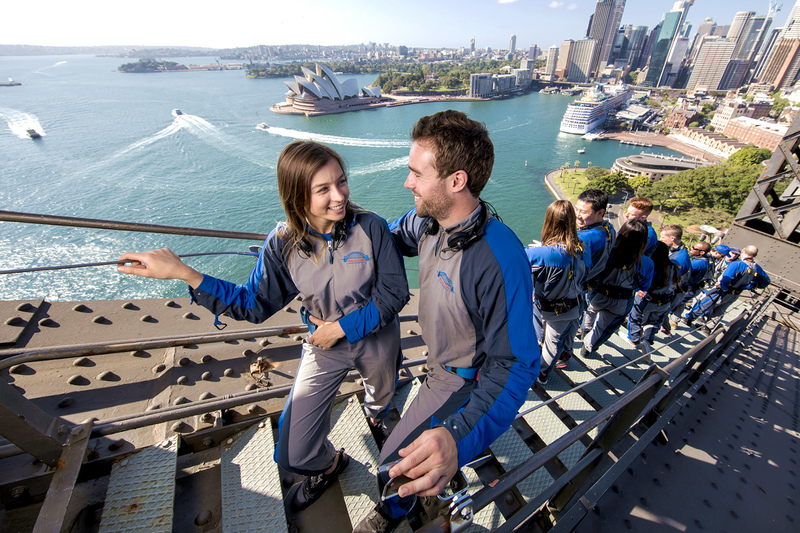 Get a taste of the world famous BridgeClimb! 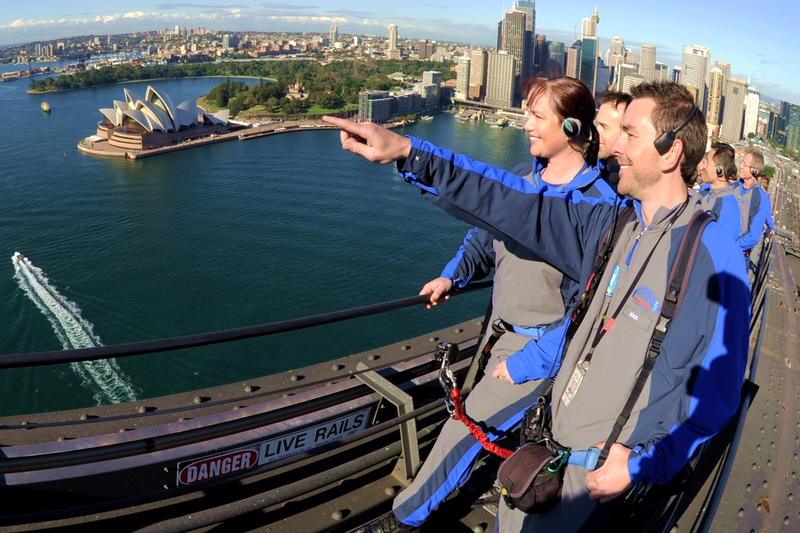 In just 1 ½ hours, ascend the inner arch of the iconic Sydney Harbour Bridge to a spectacular vantage point halfway to the top. Ideal if you have height concerns and would prefer not to go to the very top. Ideal if you want a shorter and economical taste of a BridgeClimb experience. The highest point you'll reach on the Bridge is halfway to the summit. 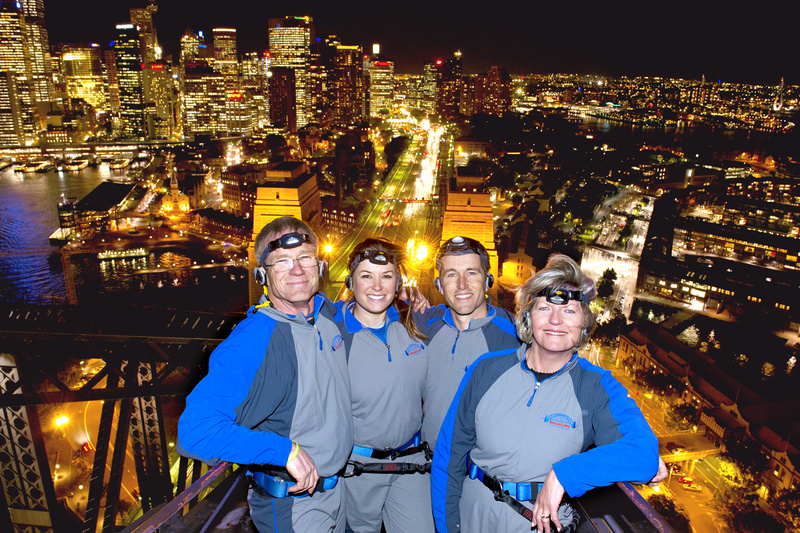 If you'd like to go right to the top, check out the BridgeClimb or BridgeClimb Express. You can do this Climb during the day (limited departures). Latching on in the Climb Base below the Bradfield Highway, you will walk on catwalks below the road-deck until you reach the South-East Pylon. Here you will ascend 4 ladders to the start of the upper arch, surrounded by the hum and buzz of Sydney's traffic. With the summit in your sight, your journey continues along the Bridge's outer arch on the Opera House side until you hit the top. After a summit celebration with your group, you cross the spine of the Bridge to the Darling Harbour side to make your descent to our Climb Base. Ideal if you're a bit nervous and would like more support from our Climb Leaders. Latching on in the Climb Base below the Bradfield Highway, you will walk on catwalks past the south-east pylon, directly over Sydney Harbour, until you meet the base of the Bridge's lower arch on the Opera House side. Here you will commence your ascent as you rise to the peak of the lower arch. At this point, you will break through to the upper arch by taking a staircase to the summit. 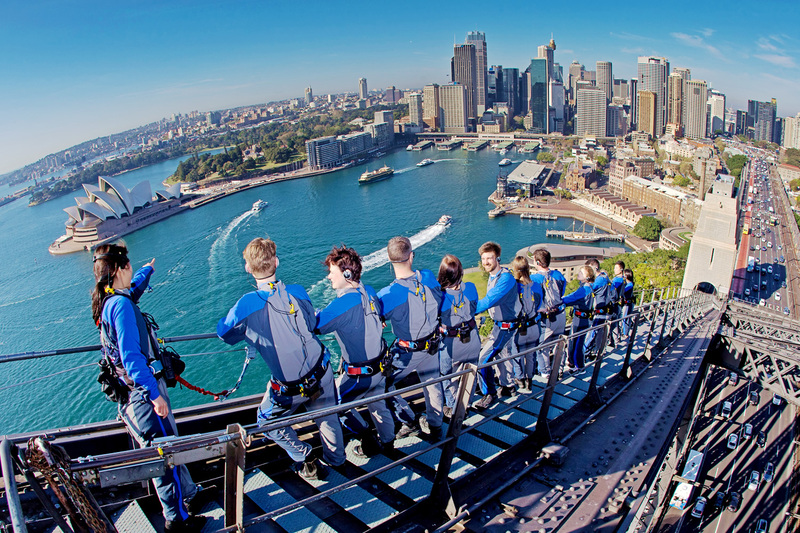 After a summit celebration with your group, you cross the spine of the Bridge to the Darling Harbour side to make your descent to our Climb Base. This Climb has more pace and fewer stops than BridgeClimb. 2 ¼ hours long, max. 14 people per group. A free entry to The Pylon Lookout. 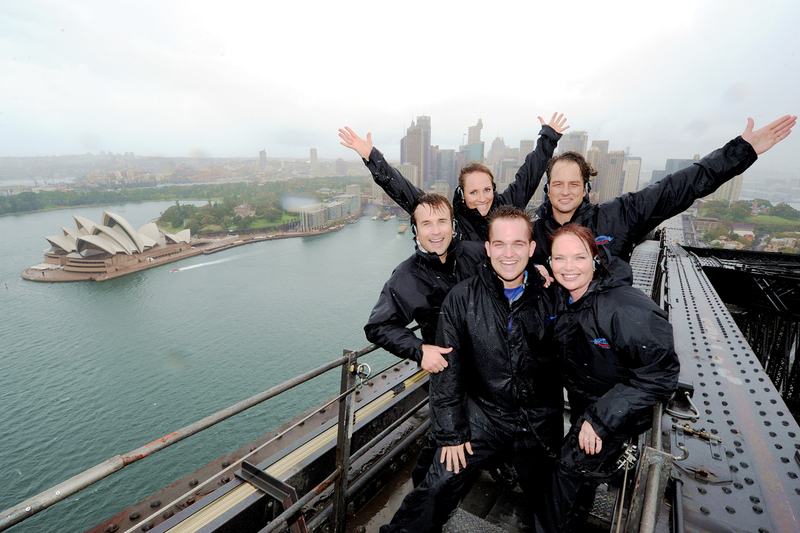 BridgeClimb Sampler (Day Climb Only) - Get a taste of the world famous BridgeClimb. Ideal for you if you have height concerns and don’t want to go all the way up! Voted #1 Travellers’ Choice Experience in Australia, and #4 globally, rest assured it’s world-class. 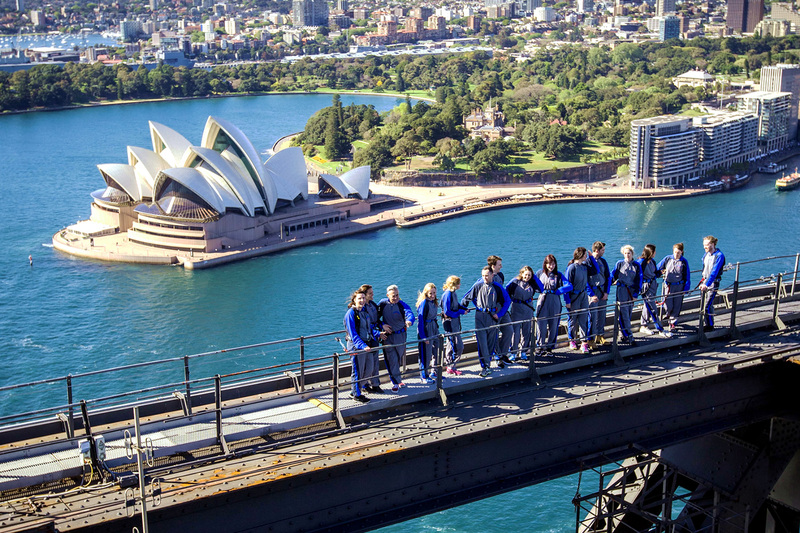 It’s true – the view from the top of the Sydney Harbour Bridge is second to none. 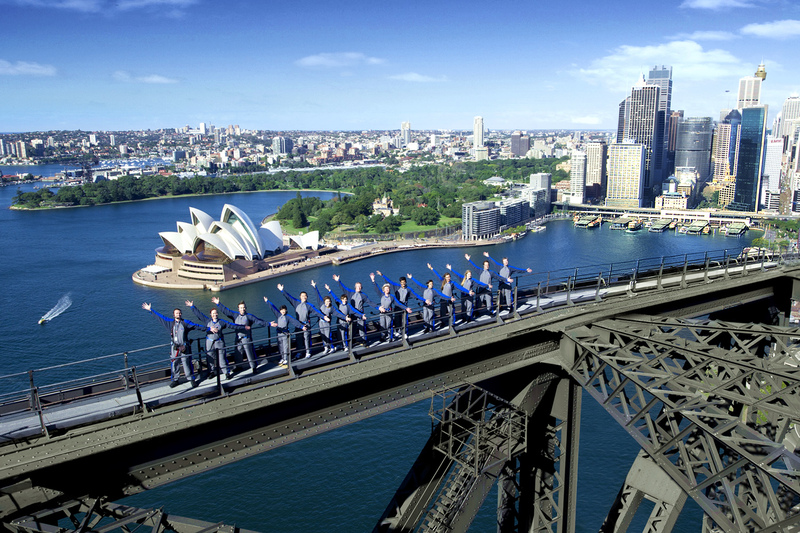 Once you step through the door you are taken on an immersive historical and cultural journey to the iconic Sydney Harbour Bridge. 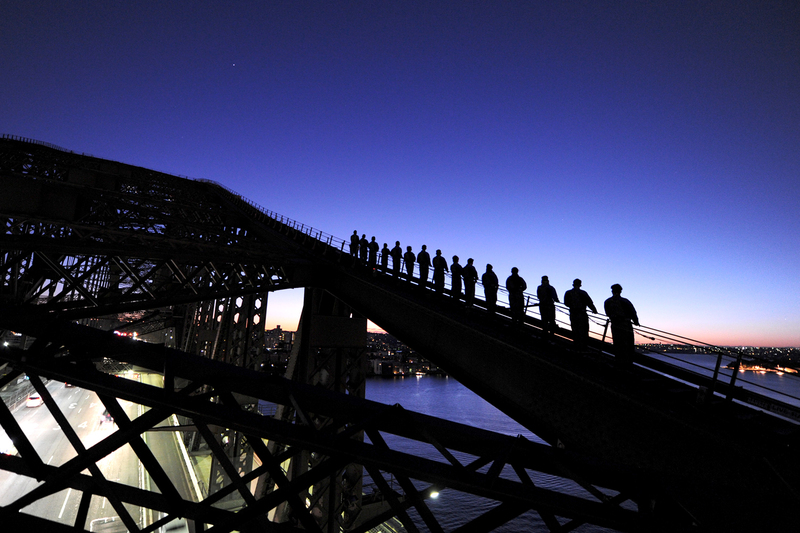 BridgeClimb Full Route at Dawn - This Climb departs before daybreak (limited departures). Spot the sun breakthrough on the horizon as the city kicks into gear. 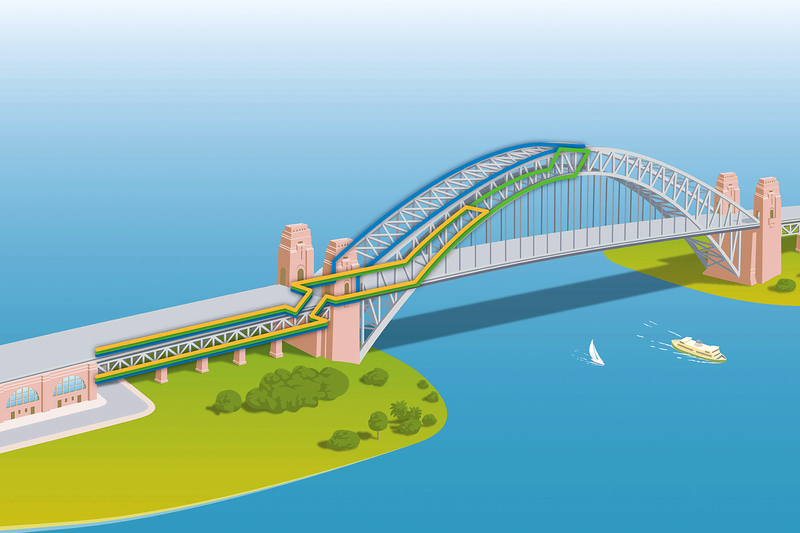 BridgeClimb Full Route at Day - Absorb a 360 degree panorama of Sydney as you journey to the summit on the original climb experience. BridgeClimb Full Route at Twilight - This Climb departs as the day closes. Get the best of both worlds as you soak up the day’s sunset while the moon takes its nightshift. All twilight Climbs experience the sunset on the Bridge (weather permitting). 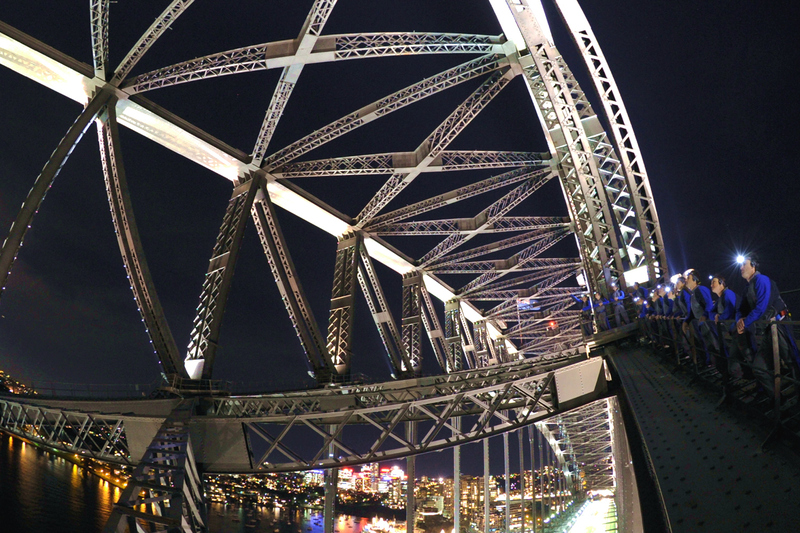 BridgeClimb Full Route at night - This Climb departs after the sun has set (after “twilight”), introducing the city alight and sparkling under a blanket of darkness. 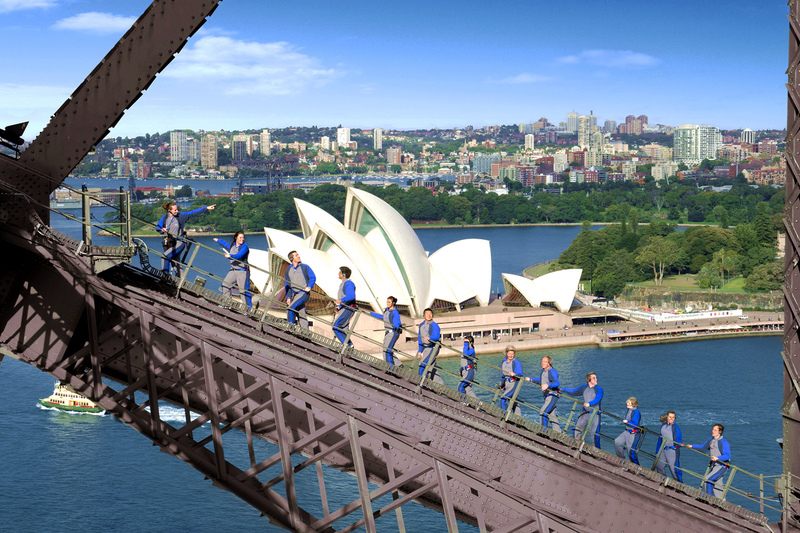 BridgeClimb Express - Accelerate your ascent to the summit. This energetic experience is the fastest trip to the top of the Bridge. 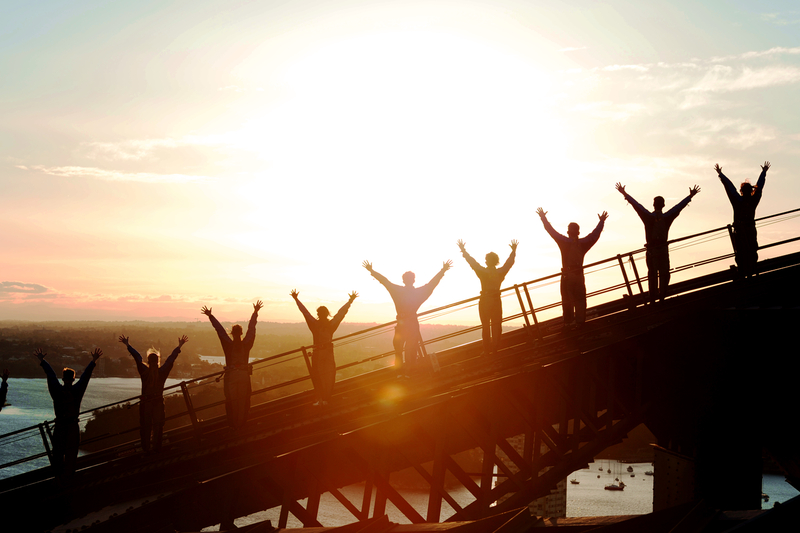 BridgeClimb Express - Ascend through the heart of the Bridge, a cathedral of steel, and burst through to the summit from below. ● Safety is, and always will be, our number one priority for all of our Climbers. ● We will equip kids of this age in smaller BridgeSuits, belts, mittens, or fleeces based on the day’s weather conditions. ● Climbing the Bridge is an all-age experience. The stories our Climb Leaders share during the experience is appropriate for a broad age range. ● Children will be required to climb with and next to their parent/guardian. ● To climb the Bridge, children must be 8 years old and 120cm tall to participate. ● Parents/guardians must remain with their children throughout the Climb experience, and must assist BridgeClimb staff by managing their equipment preparation and behaviour. Yes. 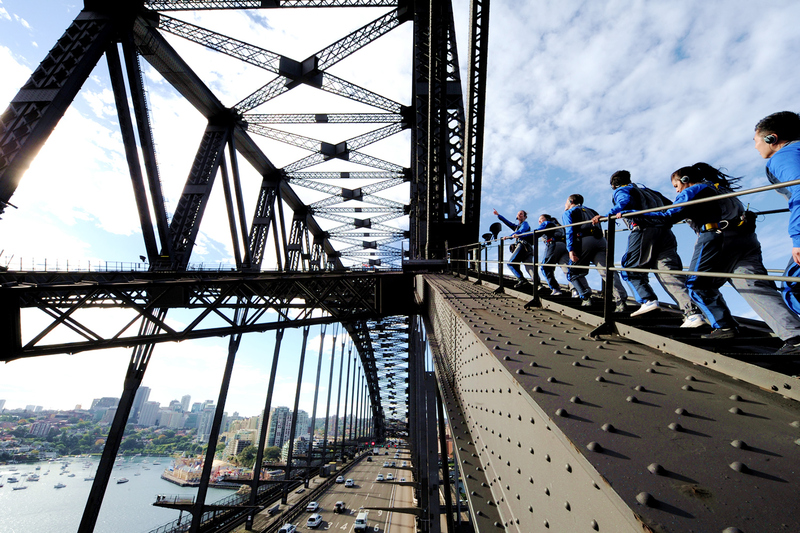 Anyone who can sustain moderate physical exertion up to 3½ hours over 1.75km should find the BridgeClimb exhilarating. If you’re over the age of 75, you can climb with a Certificate of Fitness signed by your GP. Please, download this form from our website and bring it with you on the day. Our oldest climber, Mrs Chris Muller, reached the summit at 100 years old. If you have any queries or concerns, please speak to our staff for advice. In most cases, yes. We have helped thousands of people challenge their fear of heights by climbing to the top of the Bridge. If you have any queries or concerns, please speak to our staff. We do our best to help everyone climb. To participate you need to have a general level of health and fitness, and the ability to climb independently. To find out more, please speak to our staff for advice. Yes. Please bring your own glasses or sunglasses to wear on the day of your Climb. (No DVR – digital video recorder – glasses thank you.) For more information please speak to our staff. We equip you in all the outdoor gear you’ll need for your Climb based on the day’s weather conditions and our health & safety essentials, but don’t forget to bring your own shoes! Please wear comfortable clothing on the day of your Climb in case you need to wear it under your suit for warmth.